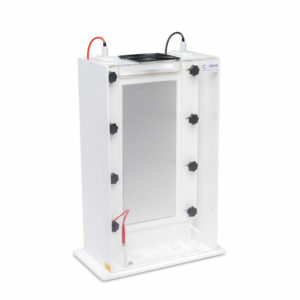 Ideal for a variety of large format vertical gel applications, these units offer advanced features for enhancing gel resolution and ease of use, essential when handling gels of this size. Each unit contains ultra soft silicone seals for easy plate sealing and trouble free runs, even over extended run times. 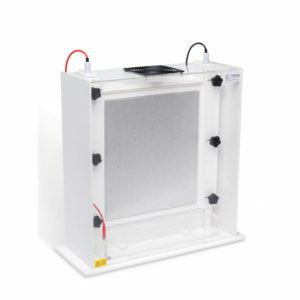 Resolution is enhanced by using an aluminium heat sink plate, essential for even sample migration. Featuring removable lower buffer tank and upper buffer tank drainage tap for added convenience. The large format units included a special buffer chamber, allowing either low buffer volumes to be used for economy or high buffer volumes to be used for extended runs. A wide range of interchangeable comb and spacer options allows a large number of techniques including; DNA Sequencing, 2-D analysis, Micro-satellite analysis, DNA finger-printing, Gel shift assays, Single-Strand Conformation Polymorphism (SSCP), Heteroduplex and Oligonucleotide analysis.